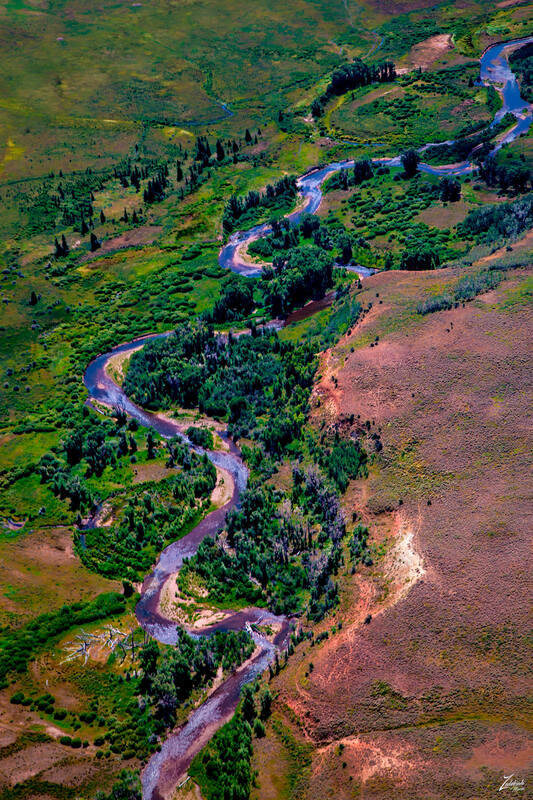 This is a tiny section of the long and beautiful Bear River, the largest tributary of the Great Salt Lake, which drains a mountainous area and farming valleys northeast of the lake and southeast of the Snake River Plain. It flows through southwestern Wyoming, southeastern Idaho, and northern Utah for approximately 350 miles (560 km) long. This is the largest river in North America that does not ultimately reach the sea. This beautiful river valley was initially inhabited by the First Nations Shoshone tribes. Eventually, fur trappers from the Hudson’s Bay Company began exploring south from the Snake River as early as 1812. John C. Frémont explored the area in 1843, and the Mormon Trail crossed the Bear River south of Evanston, Wyoming. Two very famous trails to the west; the California and Oregon Trails both followed the Bear River north out of Wyoming on the way to Fort Hall in Idaho. Some of the travelers on the trails chose to stay close to where this photo was taken, thereby populating the Bear River Valleys of Idaho and Utah. Unfortunately turmoil between the newer settlers and original inhabitants boiled over and on January 29, 1863, troops of the United States Army attacked a Shoshone winter village in the Cache Valley, slaughtering many of its inhabitants. The incident has come to be known as the Bear River Massacre.